Who will win the 2010 Oscars? In it they talk about what could possibly win at next years Oscars. Obviously it is a way off and there will be plenty of films out between now and then, but this is what they have come up with for some of the awards. Coraline — This stop-motion pic has already garnered the critical acclaim; it’s probably a safe bet to snag a nomination. Up — It’s the latest from Pixar, which means a nomination is all-but-guaranteed. 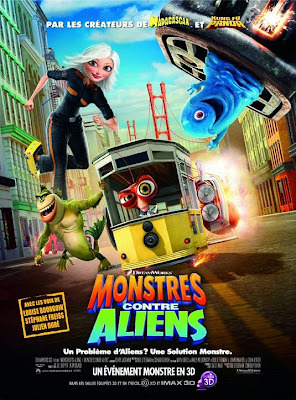 Monsters vs. Aliens — The use of 3D technology — it’s supposed to be jaw-dropping — might push it into contention. 9 — Shane Acker’s post-apocalyptic epic has some big names behind it, including Tim Burton and Timur Bekmambetov (Wanted). Plus, the animated short it is based on snagged an Academy Award nomination in 2005, which means it has the right pedigree. Martin Scorsese — Ashecliffe — Although we prefer the film’s original title, Shutter Island, you can never discount Scorsese. Michael Mann — Public Enemies — See the above category of Best Actor. With a cast that includes Depp and Bale, this will be a film worth watching. Mann is always solid. James Cameron — Avatar — Cameron’s first feature film in over a decade, this film is going to be huge. The buzz is Avatar may be a game-changer, a film that changes the way we watch movies. It may be too sci-fi to garner a Best Picture nomination, but if I were a betting man a Best Director nomination for Cameron would be a worthy gamble. Where The Wild Things Are — We have absolutely no evidence to back this up, except for the hope that Spike Jonze, Dave Eggers, and everyone else can pull off this long-delayed adaptation of the children’s classic. Nine — No, not 9, the animated feature mentioned above. Nine. Yes, this is going to be confusing. The Academy loves musicals, loves Rob Marshall, and the cast includes Daniel Day-Lewis, Nicole Kidman, Marion Cotillard, Penelope Cruz, Kate Hudson Judi Dench, and Sophia Loren. Oh, and Fergie. Can’t forget Fergie. The Lovely Bones — Recipe for a Best Picture: take an acclaimed novel about a young girl who’s brutally murdered and follows her murder investigation from Heaven. Hire an Oscar-winning screenwriting team to adapt the book; mix in an Oscar-winning director — Peter Jackson — and sprinkle with a cast that includes Rachel Weisz, Susan Sarandon, Stanley Tucci, and Mark Wahlberg. Yeah, I like it’s chances too. Check out the rest of the article for their thoughts on best actor and actress. What films do you think will be in the running for next years Oscars and what don’t have a hope in hell? If you happen to have a pair of 3D glasses lying around from a recent cinema then whack them on and have a look at this Superbowl advert for Monsters vs Aliens (I’ve not got any handy so no idea how well it works – may have to click on the Watch in HD tab maybe). Monsters vs Aliens directors Rob Letterman and Conrad Vernon introduce us to the film’s title monsters. Producers and executives at DreamWorks Animation discuss the increased use of the 3-D medium. While taking a look at the format, the featurette provides new clips and behind the scenes footage from the film. Special also provides interviews with cast and crew. The president enlists a motley crew of Monsters, confined in a secret government compound, to combat an alien robot and save the world from imminent destruction. With the voices of Reese Witherspoon, Hugh Laurie, Will Arnett, Seth Rogen, Rainn Wilson, Stephen Colbert, Kiefer Sutherland and Paul Rudd. Directed by Rob Letterman and Conrad Vernon. io9 have mention of a site called Total Conspiracy. However, upon digging deeper (and it is well worth having a good look through the site as there is just so much funny and cool stuff on it) there are little nods to the beasties from Monsters vs Aliens, as seen in the pic at the top and the clip below. Go and have a look and let me know if you agree about it being a viral site for the film. Entertainment Tonight has released a new featurette for DreamWorks Animation’s Monsters vs. Aliens featured below. Opening in theaters and IMAX on March 27, the 3-D animated-comedy features the voices of Reese Witherspoon, Hugh Laurie, Will Arnett, Seth Rogen, Rainn Wilson, Stephen Colbert, Kiefer Sutherland and Paul Rudd. 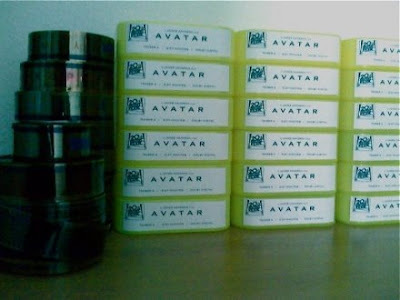 MarketSaw had this photo which apparantly shows the teaser trailer for James Cameron’s Avatar sitting ready in their boxes. At 3:57 it does seem awfully long for a teaser so these may well be fake. If it’s real I’m not sure what film the teaser may debut on. Maybe The Day the Earth Stood Still, or The Curious Case of Benjamin Button, maybe Monsters vs Aliens as that’s a 3D CGI film. What is your opinion on the photo? Real or bogus? If real what film could it be show with?